Place potatoes and sunchokes into a pot of cold water and bring to a simmer. Cook until fork tender. Drain. Add a drizzle of olive oil to a pan over medium heat and sauté the leek and onion until softened. Add the garlic and cook for a minute or so then add the white wine and cook until the alcohol has evaporated. Transfer to a blender and add the broth and creamer. Blend until smooth and return to medium heat on the stove. Add thyme and nutmeg. Season with salt and pepper, to taste. Serve garnished with freshly cracked green peppercorns and chives and top with bite-sized of candied tempeh. Combine all wet ingredients in a container or zip lock bag. Cut tempeh into ½ inch slices. Cover tempeh with the marinade and let sit overnight in the refrigerator. Remove the tempeh and set aside. Transfer the marinade to a pot and simmer until it has reduced down enough that the liquid coats the back of a spoon. Place the tempeh slices upon a non stick surface [I use a silpat on a baking sheet] that is oven safe. 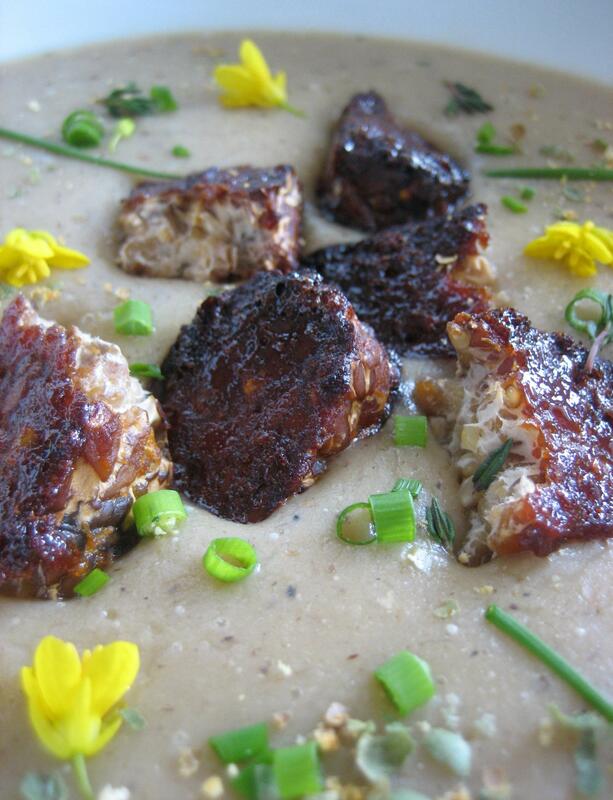 Glaze the tempeh with half of the reduction and bake for 20-30 minutes, until the glaze bakes onto the tempeh. Repeat the procedure with the remaining glaze. I’ve never had sunchokes, but I have used So Delicious coconut milk creamer for making wonderful creamy soups, so I’m really looking forward to trying this recipe. And the candied tempeh sounds awesome! Thank you for sharing. You’re very welcome. Sunchokes have a very unique flavor that is somewhat nutty and they make a really velvety soup without the need for much cream. Enjoy. I’ve never tried to candy tempeh before- what a wonderful idea. Thanks so much for sharing! Hiya Andrea! I’m glad you like the idea, it’s one of my favorites. Wow! I have never thought to candy tempeh before. This meal looks phenomenal! Thank you so much for sharing! Tempeh is *so* good candied, you’ll dig it!